This guide will help you how to successfully SIM unlock Samsung Galaxy Note 4 and use it with any GSM carrier worldwide. Have you bought your phone from a carrier such as T-Mobile, AT&T, Rogers, Fido, Telus, Koodo, Bell, Virgin and so on, by default comes carrier locked to that particular network until your contract expires with them. You can not use your Note 4 with any GSM Carrier in the US or Worldwide unless you first unlock it. If you want to use it with any other carrier/ network, then you will be forced to unlock the Galaxy Note 4 SIM for it to work. Usually, Note 4 is SIM locked because major carriers don’t want consumers to use the purchased devices with other carriers or networks. Now suppose you’ve bought your phone from T-Mobile US but when you want to use it with AT&T it will ask for “SIM network unlock PIN’. Now you may have come across individual web pages that are showing or offering Free SIM unlock method, to be honest, these tricks don’t work and therefore you should not waste your time (If you don’t believe me, Just try their method). However, we do provide permanent IMEI unlock solution that will unlock your phone so that you can use it anywhere worldwide with your choice of GSM network. Free your Galaxy Note 4, because freedom is good. IMEI: The first 15 digits. Step 5: Congratulations! 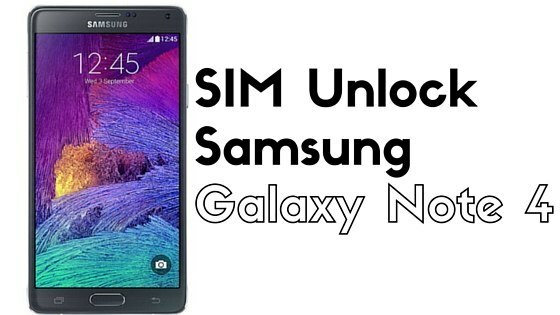 Your Samsung Galaxy Note 4 is now successfully sim unlocked.